My family loves the ginger dressings that you find at the Japanese hibachi restaurants. However, they are full of preservatives and unclean oils. I found a copycat recipe for Makoto’s dressing, tweaked it for my liking and clean eating habits, and received everyone’s approval! Yipppeeee! AND cabbage is high in Vitamin C, fiber, and helps in the battle against cancer and inflammation. Another “Yipppeeee!” for its health benefits! Place all ingredients into a food processor and process until blended. Store in a lidded, glass jar in fridge. Crushed red pepper flakes if desired. 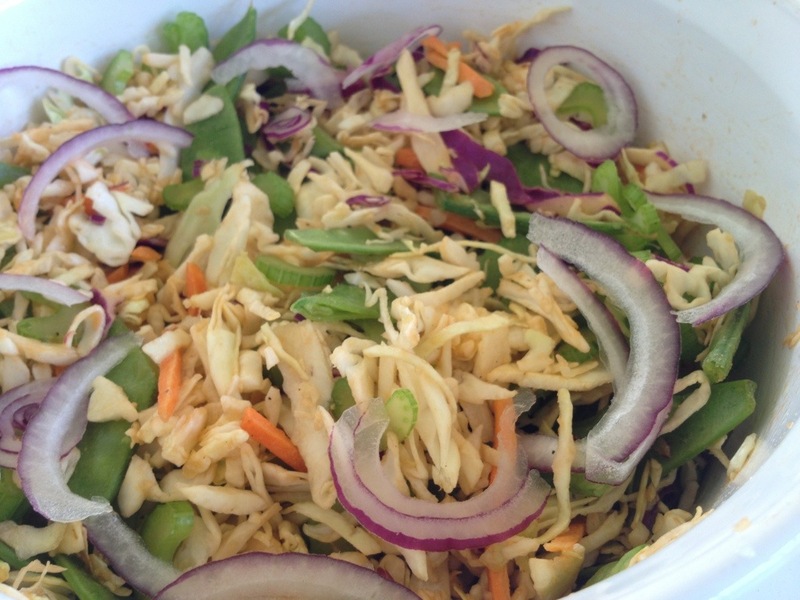 Place slaw, celery, and snow peas into a bowl. Pour approximately half of the dressing over the salad. Lightly salt and cover and chill for at least 30 min. Stir and taste and add more dressing if desired.